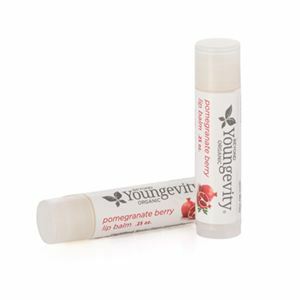 Moisturize your lips with delicious pomegranate lip balm. Hydrate dry, cracked lips with our natural lip balm. Formulated with organic ingredients, our balms include moisturizing oils and vitamin E for soft, smooth lips. Includes two lip balms. Includes two lip balms. Cera alba (Beeswax)*, Cocos nucifera (Coconut) oil*, Simmondsia chinensis (Jojoba) seed oil*, Macadamia ternifolia (Macadamia) seed oil*, Carthamus tinctorius (Safflower) seed oil, Punica granatum (Pomegranate) fruit flavor oil*, Octyldodecyl stearyl citrate crosspolymer, Theobroma grandiflorum (Cupuaçu) butter,* Butyrospermum parkii (Shea) butter*, Astrocaryum aculeatum (Tucumã) seed butter, Tocopheryl acetate (Vitamin E), Argania spinosa (Argan) kernel oil*, Ricinus communis (Castor) seed oil*, Octyldodecyl behenyl citrate crosspolymer.